This weeks episode does discuss a little bit about launching our first episode. We also talk about Amazon suffering a data leak. Finally, we update you on the progress, or lack thereof, on the Trilogue meetings in Europe regarding Article 11 and Article 13. Feel free to give us a listen or just read the full transcript below. Transcript contains all the URLs as well for further references. It’s the beginning of something new! So, our top story has to do with us. As of November, we have finally launched our own official podcast. Certainly exciting stuff! So, let’s breakdown how our show will work. Every month, we will be releasing a monthly wrapup of everything that has gone on. This includes articles, video game reviews, music reviews, and a few other oddities along the way. At the top of every show, we’ll offer you what wound up being our picks for the top three headlines of the month. Then, we’ll go into detail about what our top three picks are all about. After that, we’ll go over some of the other stories making news here on Freezenet. What follows is a brief overview of the video games and music we’ve been reviewing that month. After going over that, we’ll give you what we feel are our pick, or picks, of the month. Finally, we’ll touch on some other articles that have been making news elsewhere that are a little bit different, funny, weird, or maybe even outlandish. Who knows what we’ll find. We hope you enjoy our podcast and look forward to hearing from you. Feel free to drop us a comment or hang out in our web forums. Turning to our second big story, Amazon has suffered a data leak ahead of Cyber Monday and Black Friday. The company has sent out e-mail notifications to customers affected including Security researcher Graham Cluley. What was notable about the notification is just how light on details the information really is. While the information suggests that a leak did occur, it didn’t explain how, other than it was no fault of the user. There are no details about how big the leak was either. Still, the timing of the data leak is not the greatest for the company. It came just as we were entering Black Friday and Cyber Monday, a major time of year for stores like Amazon. The news might very well dampen shoppers mood as they search for deals online, though it is unclear how big of an impact this has on the shopping season. Finally, our third big story this month is all about Article 11 and Article 13 in the European Union. Currently, the hugely controversial copyright proposal is working its way through Trilogue meetings. The process is closed off to the public, so public input will be, at best, very minimal. While it was well known going into this that the process would be closed off to the public, digital rights advocates have been disappointed with what little progress there has been. Supposedly, the meetings were about fixing the problems with copyright. Unfortunately, nothing much has changed in the legislation. Article 11, known as the link tax, would compel websites to pay a tax for the privilege of linking to other pages with content – something that is otherwise free and a critical part of the infrastructure of the Internet. Article 13, known as the upload filter, would compel platforms to install filtering technology that would block the uploading of copyrighted material. Unfortunately, such technology that also takes into account exceptions to copyright, doesn’t actually exist. What does exist would severely undermine critical discussion, satire, and other basic exceptions to copyright. One small amount of progress that has been made in the Trilogue meetings is the possibility that smaller sites might be exempt, but this has remained just a talking point at this stage. According to many observers, the laws, as they stand now, would severely undermine the Internet for European users. The report comes just weeks after another report discussing the link tax. In that report, leaked information suggests that Article 11 could kill all Creative Commons news. The reason that the text could kill it is because license fees for linking content cannot be revoked by the creator. As such, even if the creator explicitly states that they do not wish to collect fees based on linking, the laws would overrule that wish and compel the creator to collect license fees no matter what. Earlier this month, YouTube came out to oppose Article 13, saying that the upload filter is a threat to hundreds of thousands of jobs, free speech, creators, and every day users. The proposed laws is expected to head to other more open debates after the Trilogue meetings. That’s it for the big three. Now, here are some of the other stories making news this month. The Federation of Industries of the State of Sao Paulo has suffered a major data leak. The Brazilian organization represents over 130,000 companies in the country. The leak consists of three databases. While it is unclear how big the total data leak is, the largest database contains 34.8 million records, or about 17% of the Brazilian population. Denuvo, a well known DRM vendor has suffered a major setback. The DRM used on Hitman 2 has been cracked days before the public release of the video game. It has been suggested that this development has embarrassed the DRM maker because they previously argued that DRM protection for even a few days means that their product is worth the investment. Many argue that DRM has devolved to little more than modern day snake oil that only serves to frustrate the experience of legitimate purchasers of legal content. US Senate Democrats are now pressing ISPs for answers after studies have been released saying that carriers are throttling competing services like Skype, YouTube, and Netflix. This represents the latest development in the long-running Network Neutrality debate in the US that started last year when Ajit Pai and the FCC announced that they would scrap the laws protecting consumers from throttling or blocking of content – an announcement that was subsequently followed through to the outrage of millions of American’s. Sticking to Network Neutrality in the US, California is now backing down on the network neutrality fight. In recent months the state has more or less become ground zero in the fight between State level governments trying to restore network neutrality and the federal government. In an agreement with the Department of Justice, California agreed to not enforce network neutrality until litigation has been resolved. The governor said that he was disappointed that he couldn’t bring network neutrality into force for the states citizens. In another related story, Internet browser maker Mozilla has announced that it is teaming up with Proton VPN to offer VPN services to their subscribers. It is speculated that the move is an effort for the organization to diversify its revenue streams and move away from dependence on Google. Of course, it is worth noting that the market for VPN services have been experiencing a boom over the last year thanks to the scrapping of network neutrality, so the timing of all of this is also notable. Australia is pushing ahead with plans to increase Internet censorship in their country. The news comes after their initial censorship push in 2015 where sites would be blocked based on accusations of piracy. At the core of the tightening of censorship laws is the replacement of the language “primary effect” with the phrase “primary purpose”. Critics say it would allow the blocking of virtually any website that allows user comments or user generated content. The Canadian government is moving ahead with plans on ending misleading copyright demand letters. Since the implementation of the notice-and-notice system in 2015, Canadians have received countless demands for payment from questionable anti-piracy companies. The laws themselves were never intended to allow rights holders to demand money or compel users to out themselves. The adjustment to the laws would ban settlement offers, the demand to disclose personal information, and the inclusion of links that would demand either among other things. The move has been warmly welcomed by consumer rights organizations and experts. Sticking to Canada, the Canadian RCMP have warned the public for years about frauds and scams. In a cruel twist of fate, the RCMP have found themselves to be the victims of credit card fraud. Criminals have successfully cloned a gas card and racked up 104 thousand dollars in fraudulant charges. The RCMP say that the fraudsters have been identified and that they are working with crown prosecutors to lay charges. Finally, international airline Cathay Pacific has been hit with a data breach. The breach affects 9.4 million customers. Cathay PAcific says that no one’s travel or loyalty profiles were accessed in full. However, the information that was exposed includes passenger names, dates of birth, phone numbers, emails, addresses, passport numbers, identity card numbers, frequent flyer program membership numbers, customer service remarks, and historical travel information. Cathay Pacific says that there is no evidence that the information has been misused. Still, it is worth pointing out that the airline does operate in Europe and is, therefore, subject to the GDPR privacy laws brought into force earlier this year. Those are some of the stories making news this month here on Freezenet. Planet Smashers for the Atari 7800. Interesting evolution of features for a top down shooter on an Atari system, but a steep difficulty curve and a whole lot of competition from more well known systems being around at the time really hold this game back. Poor audio and very basic graphics don’t win any favours here. As a result, this game got a 58 percent. Next up is Kirby Super Star Ultra for the Nintendo DS. Lots of great gameplay to be had cleanly carried over from the SNES version, but loses its shine thanks to some of the tweaks and adjustments that were made. Still, AI has been nicely improved. Still, a great game to play if you lack the SNES version. So, this game manages to earn an even 80 percent. We also played Xenophobe for the Atari 7800. A very solid game with nice variety. It offers just the right amount of complexity, great selection of weapons even if you could only hold on to one weapon at a time. Surprisingly well done graphics, though weak audio. Altogether, this game earned a respectable 76 percent. A fourth game we reviewed this month is Cracked also for the Atari 7800. Good variety, but flaws gradually drag this game down over time. Interesting jingles, but sound effects are a little lower in quality. An OK game, but with limited replay value. This game gets an even 60 percent. Finally, this month, we tried Galaga for the Atari 7800. Great improvements from the previous games in the series, but the improvements come too little, too late with competition from other systems at the time. The repetition does help the game at first, but, but severely limits the games shelf life. Subpar graphics and audio also doesn’t help things. As a result, this game gets an underwhelming 44 percent. So, that leads us to our pick of the month. This month, our pick of the month belongs to Kirby Super Star Ultra for the Nintendo DS. Also, be sure to check out Sub.Sound – Feel the Buzz and Voicecoil – Perfect Dark. A Hawaiian-based burger chain has been closed in Honolulu after teenage cooks uploaded a video of them cooking rat burgers onto Snapchat. Apparently, some people didn’t like the idea and the restaurant underwent a complete sensitization of cooking utensils after firing the teenagers. No word if the owner of Hannibal’s Bar and Grill is feeling nervous right now. A doctor is filing a lawsuit claiming Dal Medical School in Halifax unfairly kicked him out. The move by the school was in response to the doctor allegedly plagiarizing an essay about honesty which was requested as part of a remediation plan. It is unclear if the doctor intends on attending the school of irony after that one. South Carolina police are on the lookout for a camera thief. The thief in question is described as blond and wearing bunny ears. Be vewwy vewwy quiet. We’re wooking for camowa thieves. A camel is making news after it was caught on camera walking along a highway. While seemingly innocuous on the face of it, what made this one interesting is the fact that the camel in question was walking through a snow blizzard in the suburbs of Pennsylvania. Certainly not something you’ll see on the roads every day, that’s for sure. In a slightly more scary statistic, a new statistic out says up to 19 airline pilots have failed Breathalyzer tests prior to takeoff since August of 2017. Have a safe and care free flight. Meanwhile in Windsor Close in the United Kingdom, fire officials were alerted to a fire alarm. When they arrived, they found no evidence of a fire. After cleaning and trying to fix the fire alarm, officials heard the alarm again. As it turned out, it was a parrot mimicking the fire alarm. The officials admitted that this has never happened before and found the situation “amazing”. …and that’s this months episode for November 2018, I’m Drew Wilson for Freezenet. 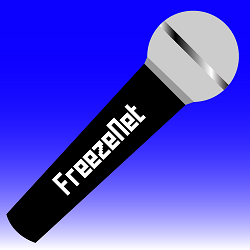 Be sure to check out our website at freezenet.ca for all the latest in news and reviews. You can also like us on Facebook and follow us on Twitter at @freezenetca. Thank you for listening and see you next time.